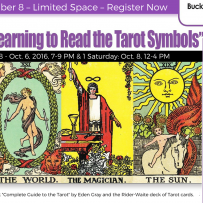 Coming up in September I’ll offer my “Learning to Read the Symbols of the Tarot” class. We’ll meet in Buckhead on five consecutive Thursdays from 7 to 9 PM, starting September 8, 2016. The course will culminate in a four-hour Saturday session, from noon to 4 PM on October 8, 2016, which will include lunch, readings, and graduation. The cost is $200. You’ll need the “Complete Guide to the Tarot” by Eden Gray, and the Rider-Waite Tarot Deck. Please note that space is limited. Paying via PayPal reserves your spot immediately. If you’d like to pay by check, Karen will contact you to confirm your spot once your payment has been received. We're sorry, but registration has now closed. If you'd like to be notified when another class is scheduled, please contact Karen.